Warm a serving platter in a 250°F oven. Pile the parsley, anchovies and garlic on a cutting board and finely chop them together. Mix in the lemon zest. Meanwhile, cut into and across the chicken breasts and open them like a book. Pound into very thin cutlets, 1/8-1/4-inch thick. Sprinkle the chicken with salt and pepper on both sides, then dredge in flour to coat. Beat the eggs in a shallow dish with a splash of water. Heat 2 tablespoons EVOO and 2 tablespoons butter in a large skillet over medium to medium-high heat. Dip 2 pieces of the chicken in the egg to coat, then saute until cooked through, about 2 minutes per side. Transfer to the warm platter. Add 1 tablespoon butter to the skillet and cook the remaining pieces of chicken. Add to the platter. Add the chicken stock, wine and lemon juice to the skillet and simmer until slightly reduced. Add the remaining 3 tablespoons butter and stir until melted. Add the chicken to the sauce, turning it to coat, then return the chicken to the platter. Add half the parsley-anchovy gremolata to the sauce, then add the pasta and toss for 1-2 minutes. Garnish the chicken with the remaining gremolata and serve alongside the pasta. In Recipes-list.com we have selected the most viewed recipes from category - uncategorized . Enjoy the best recipes specially selected for you! 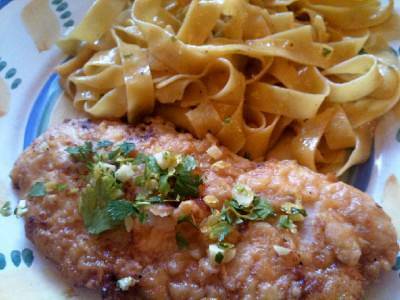 Chicken Francese and Egg Tagliatelle is the right choice that will satisfy all your claims.